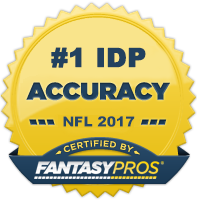 In this article, I recommend three players at each of the 3 defensive positions (DL, LB, DB) who I believe will be significantly overvalued heading into the 2015 fantasy season. This list will be continually updated throughout the off-season. DT Ndamukong Suh (DET) - 2014 was a great year for Suh as he amassed his best statistical season since his 2010 rookie campaign. Given the inconsistency issues throughout his career, it’s fair to wonder if we will see a drop off in performance now that he has garnered a large payday. Add in the fact that he carries some suspension risk and his current average draft position of a low-end DL1/high-end DL2 seems a tad high. He’s still a top 20 fantasy lineman, just be careful not to get caught up in the name and overpay. DL Jason Pierre-Paul (NYG) - After two injury-riddled years with poor production, it was nice to see JPP have a resurgent 2014 season. With nearly 80 total tackles and 12.5 sacks, he firmly asserted himself back into the elite DL conversation. Considering he finished the year with seven sacks in his final four games, owners were banking on another big year from the sixth year player out of South Florida. However, a hand injury suffered in a 4th of July fireworks accident that resulted in him getting his right index finger amputated certainly muddies JPP's value heading into the regular season. He's been very hesitant in allowing the Giants medical staff to examine his injuries and will not sign his franchise tag tender until he passes a physical. Pierre-Paul's status for the season is completely up in the air at this point. His unwillingness to reveal the extent of the injuries sustained makes me believe it's quite serious and possibly career threatening. This said, I'm avoiding JPP in my drafts until we get more information. DE Sheldon Richardson (NYJ) - Coming out of last year, Richardson was considered a top 15 fantasy linemen. However, multiple off-the-field incidents that occurred over the off-season have drastically dampened his 2015 outlook. He's currently suspended for the first four games of the season and likely has an additional suspension coming on top of that. He's a player you'll be tempted to draft if he falls, but it's best to avoid him this year altogether. ILB Kiko Alonso (PHI) - Alonso's departure from Buffalo will likely put a dent in his overall fantasy value. Not only will he now be without one of the league's most generous stat crews, but he also faces increased tackle competition via Mychal Kendricks. This said, expect some regression in Alonso’s numbers this year. He’s not a player to avoid necessarily, but you should be targeting him as a mid-to-high LB2 versus an elite LB1. ILB D'Qwell Jackson (IND) - Normally a linebacker coming off a 140 tackle season wouldn't be ranked outside the top 15; however, when over 40% of those tackles come via an assist, it mitigates his value to a certain degree. He'll have to continue to fend off Jerrell Freeman for tackles, but his big play production keeps him firmly planted in the high floor, LB3+ range. Just don't draft him with expectations of similar production to last year. WLB Vontaze Burfict (CIN) - If not for a ridiculous slew of injuries incurred last season, Burfict would likely fall into the elite tier of linebackers this year. But you can't ignore the fact that he suffered numerous concussions in a very short period of time and is coming off microfracture surgery which is difficult to recover from. My gut tells me he'll be drafted higher than this based on his extremely strong 2013 performance, but he's likely a player I'm steering away from in drafts this year especially because the risk of him landing on the PUP list is just too great for me. SS Ryan Mundy (CHI) - Mundy was a top 10 fantasy safety last year as he was a beneficiary of a weak inside linebacker group in Chicago. Although that unit remains weak for the Bears, the arrival of Antrel Rolle will make it difficult for Mundy to come close to his 2014 production. Make sure to not overdraft based on last year's results. CB/S DeAngelo Hall (WAS) - Hall has been one of the more consistent fantasy corners around over the last 11 seasons, producing 85-95 total tackles and a handful of big plays per year. At 31 years old, he's no spring chicken, however. Plus, he's coming off a torn Achilles which cost him a majority of last season. Hall will likely enter the year as the team's third cornerback behind Bashaud Breeland and Chris Culliver. There's a chance he gets moved to free safety upon his return which would help his immediate fantasy value, but as of right now there's no guarantee he will see enough snaps to be the productive player he's been in years past. SS T.J. Ward (DEN) - Ward has been one of the bigger fantasy teases in recent memory. He had a 95 solo tackle rookie campaign, followed by two very mediocre seasons. He then had a bounce back 2013 campaign, but crashed back down to average last year in his first season with the Broncos. Denver has failed to have a fantasy relevant safety the last several seasons, and I don't see that changing much with Ward.